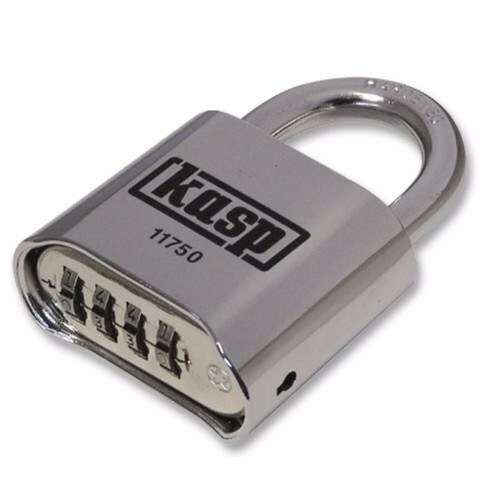 The Kasp K11750D High Security Open Shackle Combination Padlock is ideal for a range of applications such as securing lockers, sheds, gates and desks and other basic security applications. The weather resistant electro-plated lock body with rust free internal components and dual drainage system ensures that the Kasp 117 series is ideal for outdoor use, whilst offering the convenience of a keyless locking mechanism allowing the code to be set to a memorable number of choice. With its heavy weight hardened steel lock body, supertough molybdenum steel shackle and anti manipulation locking mechanism, This Kasp 117 series padlock is amongst the most secure combination padlocks available today. With a Security Rating of 6, you know you are getting a security conscious device. Hardened steel shackle for extra protection against hacksaw and cropping attacks. Hardened steel chrome plated lock body for extra strength and resistance to corrosion. Strong padlock, very tamper proof as I discovered after losing the combination. And contacted manufacturers who replaced an old one no problem. Highly recommend. Having lost both keys for my gate lock I decided that a decent combination lock was the answer. A good lock easy to set your own code & easy to use. The only criticism is the makers name which is painted on & already wearing off! An engraved name would be more durable!